I always want to preface food-advice-related posts with the fact that I am not a dietitian. That being said, I AM a certified personal trainer with the ability to help advise clients on simple nutrition-related questions such as what to eat before and after a workout. Fueling before and after workouts is an individual thing, but there are definitely some basics to understand. Ultimately, figuring out what works for you is important. Make sure to use the following as guidelines, but adjust as needed to optimize your body. This may take some trial and error, but work with the suggestions below to narrow it down. Many pre-workout food regimens are more variable than what happens after a workout. Whether you eat before a workout or not is an individual choice, with what foods you decide to eat also being tailored to the type of exercise and the duration. If you’re going to eat before a workout, some combination of carbs and protein is the most appropriate. Food should be consumed anywhere from 1-3 hours before exercise; anything immediately before could cause stomach upset as your body will simultaneously be trying to digest food and cope with the stress being put on it from exercise. 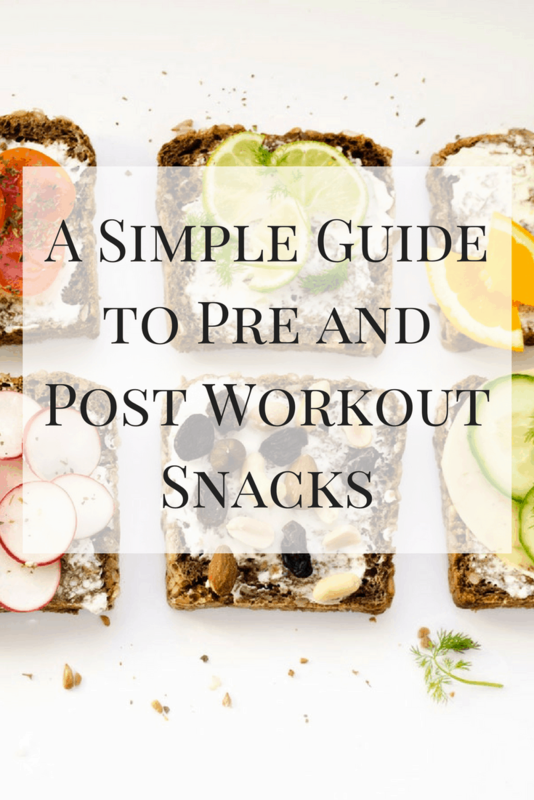 For both pre- and post-workout snacks, you want to look for a mixture of carbs + protein, but the main difference is that the carbs in a pre-workout snack should be simple rather than complex so your body is able to quickly break them down and use them for energy (think fruit, rice cakes, etc.). Personally, because I work out first thing in the morning, I don’t eat anything. I’ve tried it both ways and it’s really not for me. For one, I’m not hungry at 5:30 am and two, my workouts start at 6:15 am which wouldn’t give me enough time to thoroughly digest my food in the first place. Whether you decide to eat or not before a workout, you should ALWAYS refuel afterwards. During a workout, your glycogen stores lessen and you’ve broken down muscle fibers. Strength and muscle gains are a result of breaking down muscle and rebuilding it with the help of protein. Glycogen is replenished through carbohydrates, so just like you would in a pre-workout food regimen, make sure that your snacks following a workout contain a good balance of protein and carbs. Ideally, you would want to eat as close to the end of a workout as possible, but a window anywhere up to 90 min post-workout should still be good enough for you to get the effects of the protein and carbs. If you’re not able to eat protein following a workout, don’t fret — it won’t be like the workout “never happened,” but your body won’t be in its ideal recovery phase. It’s fine if this happens from time to time, but to really get the most out of your workouts, try and plan for proper fueling afterwards. If I’m able to come home in the morning right after working out, my larger refueling meal is a breakfast of 2 scrambled eggs + egg whites and an English muffin with cashew butter and cherry jelly. YES PLEASE. Let me know some of your favorite pre and post workout snacks below! I often have the bowl of oatmeal + fruit + nut butter post run. I also love a glass of chocolate milk, or scrambled eggs. San recently posted…Review | Why I am (still) using YNAB. I work out early too, so I don’t like to eat before I go. I usually stick to a cup of tea with Vital Proteins collagen peptides and almond milk beforehand. After strength training I usually have a protein shake made with Vital Proteins collagen whey mixed with coconut water. Then I’ll eat a regular breakfast after I shower/get my day really started. I find after working out I’m not super hungry (even though I haven’t really eaten anything yet), and the protein shake is a good bridge until I feel more like eating something. I’m up at 4am to workout, eating that early isn’t an option, I’m really just not hungry. But after, OMG, feed me. I typically grab a high protein shake or a bar because it’s back and forth taking 3 kiddos to 3 different schools for the next couple of hours and I need something until I get home and get a chance to eat my real breakfast. I stink at refueling especially after a workout; sometimes I do, but I think I should make a point to get in something. Awesome tips Erin, thanks for sharing it. I normally don’t eat too much after a workout, but before and during it I eat a lot of bananas and protein bars. I also always eat something salty to control my electrolytes. By the way, greek yogurt + a fruit is my favorite breakfast of all times. I occasionally eat that before a workout too.